Welcome to the June celebration here on Dreamwalks! Peggy’s stopped by to answer some questions about her newest book and to offer some lucky Dreamwalker a chance to win a signed copy. (see details below) And if you live in the Seattle area, come join Peggy at the Book Launch Party, Sat. June 9th at 2 pm at Brick & Mortar Books! 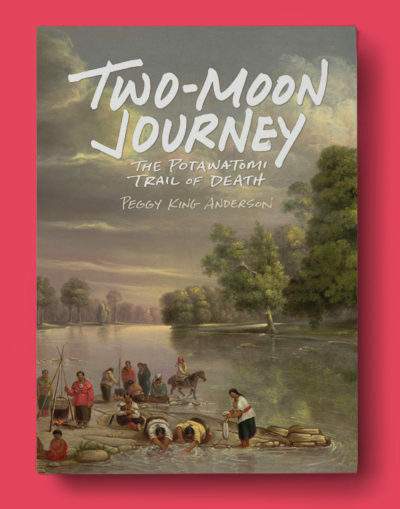 TWO-MOON JOURNEY Depicts the Potawatomie forced march from Indiana to Kansas. An important yet little-known part of our history is brought to life through the eyes of the eleven-year-old Potawatomi girl, Simu-quah (See-moo-kwa). Learn more on her new website . TWO-MOON JOURNEY is the story of my heart. It’s the story of my husband’s people, the Potawatomi (Pot-a-wot-a-me). And of my children’s people as well since all five of them are registered on the Potawatomi tribal roles. Of all the books I have written, this is the one I love the most. It has become my story in the telling of it, a story of injustice, but also of forgiveness and reconciliation. My husband, Ken Anderson, was raised hearing the stories of his heritage. After we married and had children, we moved to Washington State and began to attend the Regional Councils of the Citizen Band Potawatomi. 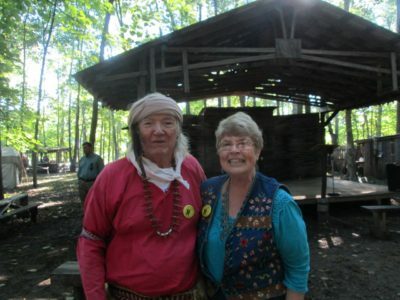 When our regional representative, Susan Campbell, and other Citizen Band members heard I was a writer, they encouraged me to write the stories of Neshnabék, the People, as the Potawatomi sometimes refer to themselves. I heard a lot about the Trail of Death, the forced removal of the Potawatomi from their homelands, and found myself drawn more and more into that powerful and sad story. But I couldn’t figure out my own personal way into the story. Then I discovered Sister Virginia Pearl, a Citizen Band Potawatomi who told of her great-grandmother, Equa-Ke-Sec, 11 years old at the time she journeyed the Trail of Death. Sister Pearl spoke vividly about the crowded, smelly wagons, and the illness, and the thirst—but also of Equa-Ke-Sec’s courage. Her account formed the basis for my nonfiction article, “The Long March,” published in Highlights for Children magazine in October 2002. 2. 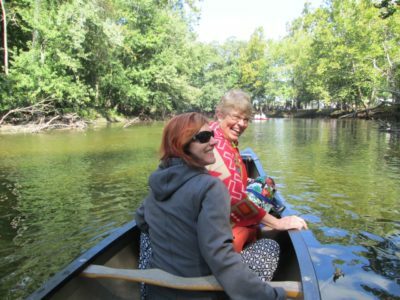 Can you share photos from your trip back to Indiana? 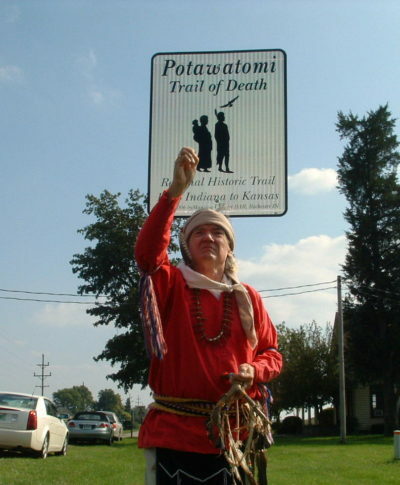 Potawatomi Elder, George Godfrey blessing the first commemorative road sign of the Potawatomi Trail of Death. Peggy’s son, David Anderson designed the logo. 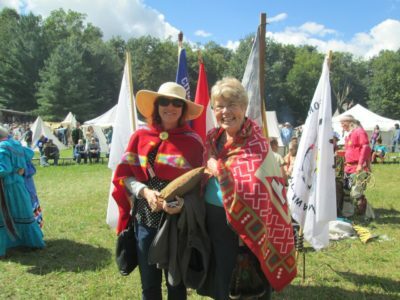 Wearing Native-American blankets presented to them at the Living History Festival. 3) You personalized the journey on The Trail of Death, telling it through the eyes of young Simu-quah, (SEE-MOO-KWA) as she walks with her family and tribe. Reading it, I came to care so much for Simu-quah, a quiet hero who struggles with anger and bitterness and still makes courageous choices. How did you go about creating this memorable character? 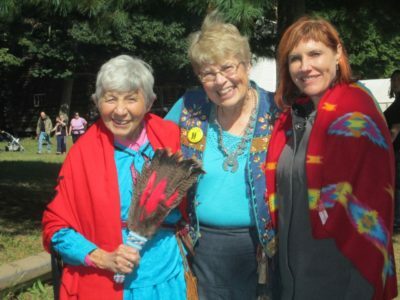 Simu-quah is strongly based on Equa-Ke-Sec, the great-grandmother of a real person, Sr. Virginia Pearl. 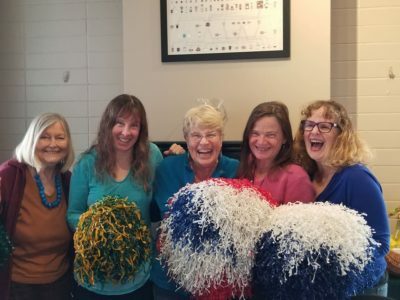 It was her retelling of the oral history of this girl who was 11 years old at the time of the march, that began to bring Simu-quah to life for me. I loved how strong this young girl was, bravely walking 660 miles, seeing many of her relatives become sick on the journey, some dying from typhoid fever, which was affecting all the tribes forced to leave their homelands. She was often hungry, with only a thin cornmeal gruel for food, and unable to quench her thirst in this time of drought. When the weather turned cold at the end of the journey, she had to walk barefoot in the snow, after her moccasins wore out. Of course, as I wrote the book, parts of myself became part of Simu-quah, her stubbornness, her anger, and her growing awareness that bitterness kills you fast as any poison. I like to believe that the inner strength Simu-quah found in her ability to forgive at a critical time in the story, transformed me as well, in how I deal with some of the hard things in my life. 4) What challenges did you face writing historical fiction for young readers? I got so excited as I read the actual journals and diaries of the time and tried to cram in way too much information about the time period, too many historical details. I had to make myself stay in Simu-quah’s Point of View, and let the story unfold as she experienced it. I also found conflicting views, even among the experts about what happened in certain points of the journey, for example, whether or not the soldiers burned the Twin Lakes village when they forced the Potawatomi to leave. When you read that chapter in the book, you’ll see how I tried to be true to the differing accounts. My Afterword for the book talks about this as well. 5) Finally, what is your hope for this book? My hope for this book is that children who have never even heard of the Potawatomi will be inspired by the courage of Simu-quah and all of her people in their time of injustice and hardship. I hope children of all ages, up to 102 and beyond and will look into their own lives to turn out bitterness, to forgive, and to grow strong as they move forward in love for whatever their own life journey may hold. My editor, Teresa Baer, expressed her hope for my book in a way that resonates with my own. I share her letter here, with her permission. I know this is a lot to ask from one book of historical fiction for young readers. But, I think it is a reasonable hope if one thinks in the long term. I am grateful to have helped get this book published. Just as it is for you, for me it is a legacy piece. When I was here on Earth, I helped publish this book to try to make this a better world. I will always be proud to have been a part of it. Thank you, Peggy, for stopping by and sharing your book with us. Teachers will welcome the personal story rich in details and characters that bring this incredible and difficult journey to life in the way students will understand. 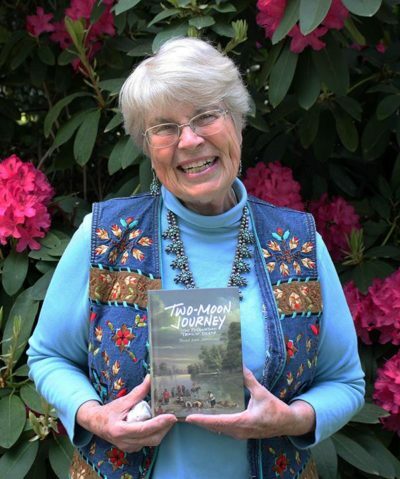 Simu-quah’s personal struggles with the historical incidents of this journey and the decisions she makes along the way will engender interesting classroom discussion. The Indiana Historical Press added educational paintings, photographs, and descriptions throughout the book. There is also a glossary and a dictionary of Potawatomi words in the back. Such an interesting conversation. I can feel the passion, Peggy! I felt it at Inside Story. I’m very happy for you – and happy for all of us that you wrote this story. “Legacy piece”–there is no higher praise for a book than that. May this legacy piece find its way to readers everywhere and may the book be as beloved as its author is to us. We cannot wait for this wonderful book, Peggy! What a gift.